Nowadays, HiTech smartphones equipped with the latest technology in the market. These smartphone comes with tremendous features but they consume a lot of battery and this is the reason why they have to be charged repeatedly. So far in the case of fast charging, Oppo’s SuperVOOC is on the first rung. According to the latest news, Xiaomi Super Charge Turbo Charger will launch today, which will charge your smartphone battery in just 17 minutes. The latest smartphones consume too much battery and this is the reason that they have to be charged repeatedly, so you have facing a lot of trouble. Normal chargers take a lot of time to charge your smartphone battery. Fast charging technology is running between smartphone makers these days. At present, Oppo’s SuperVOOC is on the top of the list with fastest wired charging, which comes with 50W power output. The Oppo’s SuperVOOC chargers comes with 10V / 5A power supply and charges the battery in two parts. Huawei launched the 55W Fast Charging Mate X in the MWC 2019, but it has not been commercially marketed. In the race of fast charging, another smartly-built smartphone maker Xiaomi has also joined. Xiaomi wants to stay at number one in fast charging. So that, today company launched his latest super charge turbo charger which full charge your smartphone battery in just 17 minutes. It has been named with Xiaomi Super Charge Turbo Charger. Xiaomi told that he could launch this charger in the event organised in China today. This charger works fast and works better than any other charger. So if you want to buy a fast charging charger then it is a stunning charger for you. Before launching the new Super Charge Turbo Charger feature, Xiaomi has introduced a glimpse of this charging technology. Xiaomi’s President Lin Bin, while teasing his fast charger on social media site Weibo, said that his charging system is much faster than OPPO SuperVOOC. Xiaomi’s Super Charger This charger comes with Turbo 100W charging, 5A and 20V power supply. Oppo’s SuperVOOC charger comes with 50W Solution 10V / 5A power supply. Xiaomi told them what is the main difference between Super Charge Turbo and SuperVOOC while posting a video on YouTube. Xiaomi Fast Charger charge up to 100 percent in only 17 minutes, while OPPO chargers charge only 65 minutes in 17 minutes. At the same time, the 55W charger is charging Mate X full of 35 minutes. 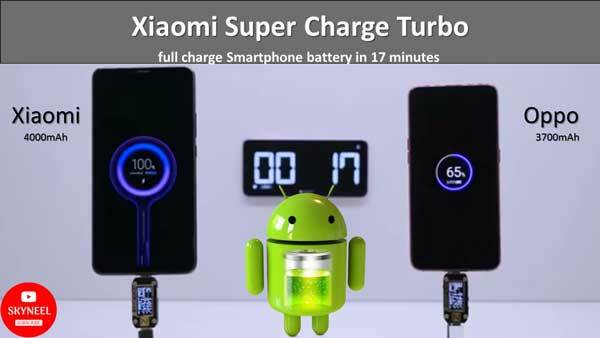 So, as per comparison you can check Xiaomi Super Charge Turbo charger much faster than all other charges. If you also facing slow charging issue then there is no worry, you can buy this fastest charger when it is available in the market.